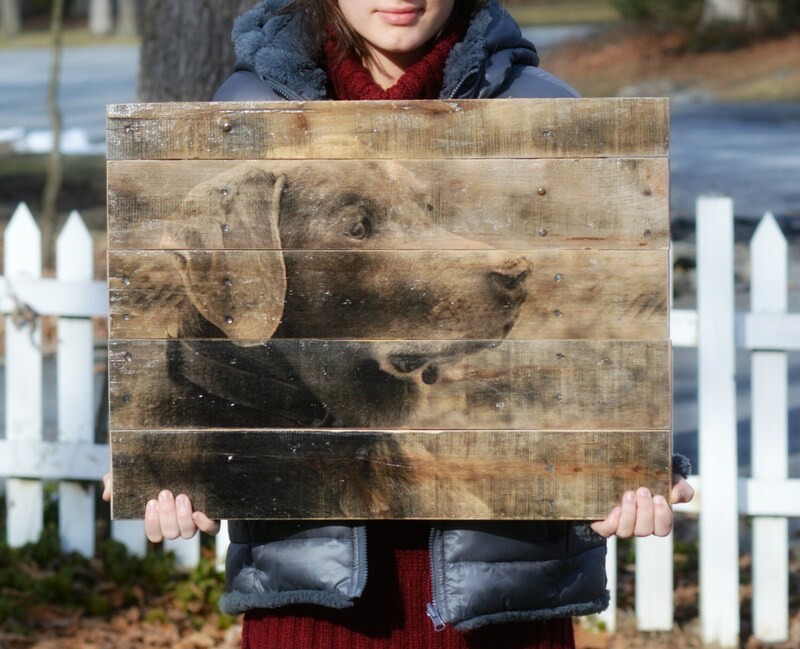 Large Custom Wooden Photo. 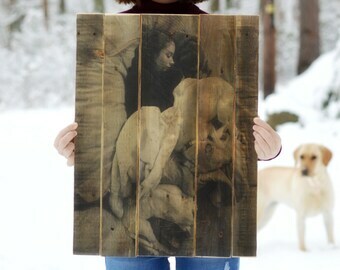 Wood photo transfer on reclaimed pallet wood. 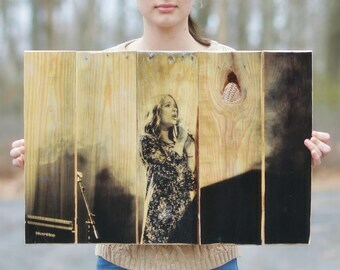 Your custom wooden photograph will be created by directly transferring your photo onto a piece of reclaimed pallet wood. Natural wood grain, nail holes and imperfections shine through each piece. 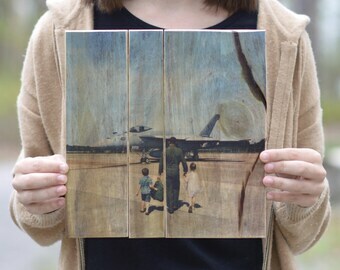 Your wooden photograph will be finished, sealed and come with hardware ready to hang. The size you choose is approximate as the proportions of photos vary, I will come as close as I can with the photo you send to the size you choose. If you have a square photo please choose a square size unless you want me to crop it, if so let me know. Thank you! 3. After checkout, send me a message here on Etsy at the bottom of the message window you can "attach image" in the bottom right corner. Upload your photo there (must be in a JPEG format). Please choose the highest quality photo file you can, 300 dpi or higher will create the best large wooden photo. ~Each piece will unique and made to order. ~Each piece will have slight variation of wood grain, and markings. ~Color and texture may vary. 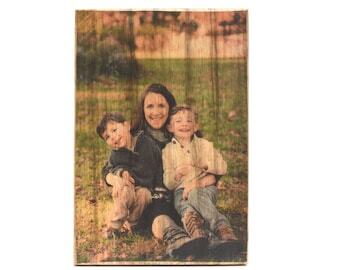 I can create your custom wooden photo into many sizes. 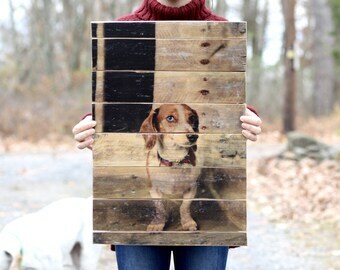 Sizes are APPROXIMATE as I match up each photo to the perfect piece of wood. 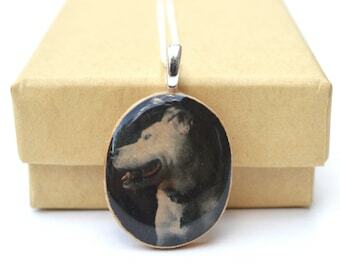 I purchased for friends who recently lost their beloved dog Zoey, they both teared up when they opened the package so it was clear they loved it! Placing order was easy, delivery was sooner than expected and workmanship was exceptional. Highly recommend. 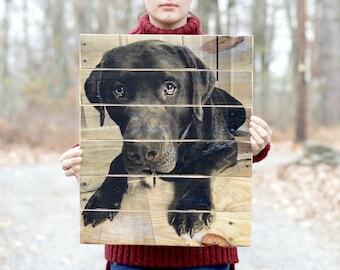 dad photo gift personalized dad gift Reclaimed Wood pallet Photo personalized gift photo gift Photo on Wood Wooden photograph.